The lingering snow and wintery weather in Michigan this year is not unlike that of London’s 1963 Poplar Neighborhood. 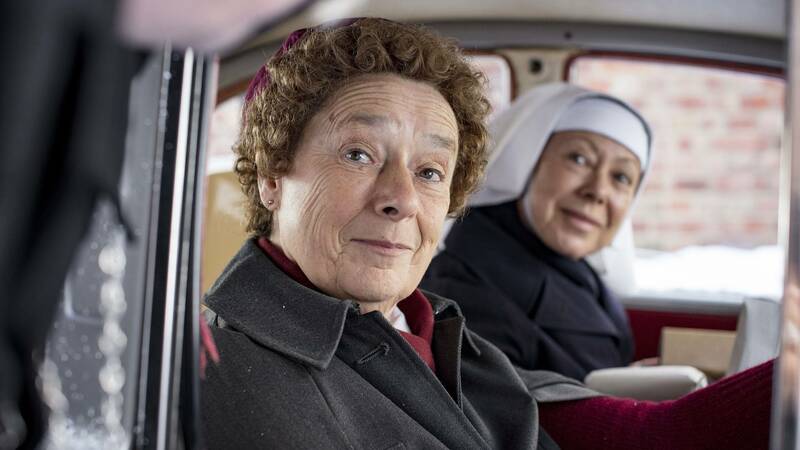 As a retired midwife, I now have the luxury of avoiding the roads during bad weather and have used my time at home as an opportunity to indulge in the pleasure of re-watching previous seasons of “Call the Midwife” on my internet streaming service. As I watched the Season 1, 2012 dramatization of the young midwife, Jennifer Worth in 1957, inspired by her memoir, I could not help but reflect on my own life and midwifery career, its influences and the meaning of it all. I have come to realize that my experiences with birth and midwifery continue to inform me about every aspect of human experience. In this first episode of season 7 we observed the Nonnatus House midwives employ their skills to ease the transition of their dying patient. In the last few months I‘ve observed 4 of my nurse and midwife friends guide their elderly parents through the transition out of this world as skillfully as midwives guide newborns in. My retirement has also provided another luxury: I have time and energy to care for and enjoy my own elderly parents. Time with my parents and the snowy weather has inspired me to record some of our family stories. In a past episode, Sister Monica Joan tells the story of Nurse Valerie Dyer’s birth in a blizzard. I am about to relate another story of a snowy beginning of a future midwife. Where does the initial inspiration and drive to be a midwife come from? Perhaps it begins at the beginning. My own birthday occurred 9 days before Christmas, on my mother’s own 25th birthday. The charm of celebrating my birthday with my mother’s included the annual recitation of the story of my parent’s journey for my arrival into a cold snowy Detroit. The story goes that it had been snowing gently but steadily for hours the morning I was born. My mother woke to the pain that she had been told to expect in labor. She then woke my 23-year-old father; her husband of 2 years to tell him it was time. They were just starting out, had little money and their transportation was a well-used, very old 1936 Ford. The heater didn’t work, so my father made sure to bring blankets to wrap my mother in while they made the 16 mile journey to the hospital. I can imagine how carefully my always-protective father must have driven with his young expectant wife. On the dark snow covered streets they made their way from their suburban Dearborn bungalow to Northwest Detroit where Brent Hospital sat on the boundary of University of Detroit Mercy. Brent Hospital was demolished decades ago but its place in the story remains. In those dark, snowy, cold conditions and unfamiliar streets my father turned too soon and ended up on a dead end street fenced off by the University’s playing field. “We could see the hospital across the field but we couldn’t get there” he would say, his voice reflecting the memory of his frustration and concern. While my father rocked the car back and forth to shimmy out of a snowdrift to turn around, I can imagine my mother quietly panting during each contraction so as not to add to the drama of the moment and create more pressure on her young husband. She commented once that she thought her foot might go through the old car’s floorboard with each labor pain. Finally the car was freed and turned onto the right path. After my father successfully delivered my mother to the front door, hospital attendants carted her off to the maternity ward while he parked the car. My mother was always vague about specific details of the birth but apparently I was born soon after her arrival to the hospital. Dr. Borrows, a general practitioner and beloved family friend (like Dr. Turner?) who attended the birth was reported to still be wearing his snow-covered galoshes at the delivery. After the birth, my mother tells of hearing a conversation between two nurses talking and laughing outside her postpartum door. “All she can talk about is that she had a baby on her birthday”, said one nurse to the other. “You were the best birthday present I ever got”, my mother always adds and has told me on every shared birthday since that day. My own research verified that the year of my birth was one of the snowiest Michigan Decembers on record and indicates all time record low temperature in Detroit at -3F on my birth date. Based on these records, the "whitest" (most snow on the ground) and also the second snowiest Christmas (snow falling on Christmas) goes to the Christmas that year! Over a foot of snow was recorded on the ground late Christmas day with 6.2 inches of that snow falling just that day. In that era it was common for postpartum women to stay 7-10 days in the hospital. Nestled and wrapped warmly in the arms of my mother, I presume my first journey home; very near that very snowy Christmas day was rendered as precarious and cold as the journey there. My parents thought they might name me my mother’s middle name, Patricia but Deborah was popular in that era and stuck. Later in school, I had three classmates named Deborah so I often went by my middle name: Dale, which is my father’s middle name. As first-born, they thought Dale was a nice compromise in case they did not have sons to use the name. Subsequently, I became the only sister to four brothers. This only, older sister role offered plenty of care giving experiences throughout my childhood. Becoming a nurse seemed a natural choice for me. It is hard to imagine what stories or experiences influence one’s life decisions and attitudes. Hearing the story of my birth told with joy and love was at least an annual experience. This repeated story taught me that birth is an important, joyful, loving event. As a young adult my path led me to an opportunity to help others through this experience of birth as a nurse and then a midwife. It is not hard to imagine that the voices of my parents telling their own story remained always in my head and continued to reinforce the importance of this work.